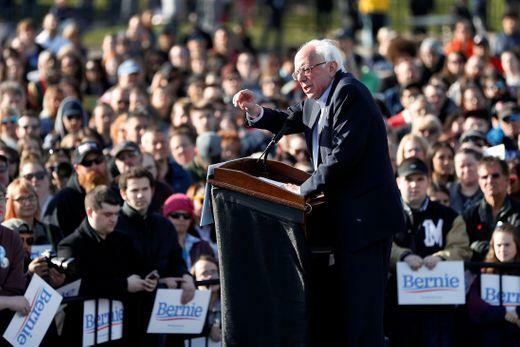 WARREN, MI (MPRN)-- Democratic presidential candidate Bernie Sanders completes a campaign swing through Midwestern battleground states Monday that included a stop in Michigan over the weekend. Sanders told a crowd at a rally in Warren that President Trump is failing to deliver on his promises to working-class voters. But Sanders told a crowd at Macomb Community College the President is a “pathological liar” whose trade policies are driving jobs away from the U.S.
Sanders vows to offer single-payer health care coverage and free college tuition, just as he did when he unexpectedly won Michigan’s Democratic presidential primary in 2016. “When the people of this state demanded a government and an economy that works for all people and not just the one percent,” he said. Sanders adds that his ideas were once seen as radical, but have since been adopted by almost every Democrat running for president.